I've been curious about Stitch Fix for awhile, but my size prevented me from giving it a try. But since April I've lost 27 pounds, and I finally decided that the time was right to give this a whirl. If it was all terrible, well, at least I knew it wasn't for me, and I was out $20. But I was really intrigued by the idea of a stylist picking clothes for me. The Style Profile is really detailed--it's just not stuff like your weight and height. They want to know as much about you and your style as possible, from how much skin you like to show, to your proportions, and what kind of trends and styles you'd like to try. You can even set a price range for individual categories and ask them not to send certain things. For example, in my Style Profile, I ask for no bracelets, rings, or just about any type of shoe other than a flat or heel. There's also a place to add a link to your Twitter, Facebook, Instagram, or Pinterest Style Board, so your stylist can get a feel for what you like. Finally, there's the "style note", where you can ask for specific items, talk about events that are coming up (I mentioned my brother's wedding in the spring), or generally discuss your style or anything you'd like to see in the box. So, after you fill out the Style Profile, you will pay $20 as a styling fee. This is taken off any items you decide to keep in your Fix, so I look at it as a down payment on whatever's in the box. Keep in mind that a real person will personally select all five items that come in your box for you, based on what you've told him/ her. When the box arrives, it's time for the fun--trying on pieces. This is where I think Stitch Fix has a leg up over normal shopping. Since the box is shipped to you, you have your entire wardrobe at your disposal when you get these pieces. You can see right away if the things that were sent work with items you already have! You don't have to stand in the dressing room and think, "Do I have anything that will go with this? How will this look with my favorite heels? Do I already have things this color?" To me, that was huge. I'll explain more in a second, when we get to the pictures. Five items are in every box. Along with that, you get a pre-paid USPS envelope (A BIG one) that you use to send back whatever you don't want. It's already labeled, all you have to do is put the clothes you don't want in and drop it in the mail box! You also get a note from your stylist, as well as style cards for each item in your Fix. The style cards show two styling ideas for each item. As you can see from my note, my stylist, Christine, went above and beyond! She looked at my Pinterest board, and read my notes, and took them seriously! Three of the items I received were directly based on what I asked for, and the other two are totally my style. Elbow patches that weren't elbow patches. These are more like forearm patches on me, because the sleeves were too long--I have short arms--so it didn't work the way it was supposed to work, and made the shirt look too big. I loved this item, except for those dang patches! This was an item I specifically asked for, and I love it! I love the navy color and the whimsy of the polka dots. The coat also has a hood, and an adjustable waist, so you can cinch it however you want. A better view of the cinched waist. The coat has a lovely soft liner and great pockets, so I knew this was a keeper. It's going to be one of my favorite pieces! So as much as I loved this one, it was a no go. This was another item I asked for specifically--a jersey skirt. I hate pencil skirts and like A-lines, full skirts, anything that's not a pencil. Christine saw that and sent this one accordingly! Styled here with the same J. Crew indigo tee and black Clarks flats--the more casual look. 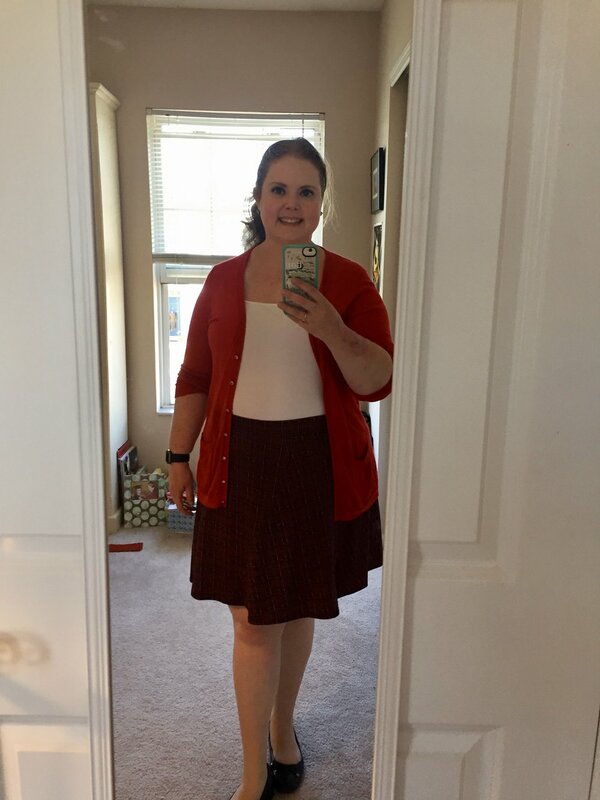 This is with a J. Jill white camisole and a Banana Republic red v-neck cardigan (very lightweight so it's a great layering piece). I adore this skirt. I love that I can interchange it with so many things--I even have a navy blue cashmere sweater from J. Crew that will look fabulous with this. I can wear it with flats, or I could wear it with tights and heels or my boots. This is a total winner! The white part is sort of fuzzy--very soft, and the navy blue detail around the neck is mesh, but it works! This dress is going to be great for so many things--Easter, wedding rehearsal, bridal showers, etc. I'm so excited to wear it! I didn't take photos--bad blogger--but I tried this with my red cardigan from the previous item as well as a J. Crew navy blue cardigan I had, and both were winners. This dress could be styled up or down, depending. I could wear pearls with it, or a more casual necklace; I could wear my gold Sperries or my favorite patent leather black heels. I love a good mix and match piece. And this dress was so comfortable! I would've kept everything in my Fix, if not for those pesky elbow patches. If you keep all five items, you get 25% off your order! But those patches were my downfall, so those pieces went back. Once you decide what you're keeping, you go to "check out" on the Stitch Fix page/app. Be very specific about what you liked/didn't like about each piece, so your stylist can get the best feedback possible! And now, for TIPS and FAQs. You do not have to receive a fix every month. You can receive one every 2-3 weeks, every month, every other month, quarterly...there's a bunch of ways to set it up! There is NO obligation to buy another box after your first one--it's completely up to you. I have heard that it can take two boxes to get you and your stylist to jell, so I do think it's probably worth getting two boxes, which I would've done even if I hadn't loved everything here. The fact that I loved everything just made it even easier! You can also adjust your Fix shipment schedule at any time. If you want to try Stitch Fix, I'd appreciate it if you'd use my referral link: I get a $25 credit for every Fix purchased via my link. However, my opinions in this post are totally my own. Stitch Fix didn't pay me to write this! 1. Be VERY specific when filling out your Style Profile. I wrote things like "I hate pencil skirts, distressed/ripped items, dolman sleeves, and stilettos." I also dislike skinny jeans and ponchos, so I wrote that as well. I also noted that my brother is getting married in the spring, so I'd like to see spring dresses, and that I love flats and A-lines. In addition, you can write a note to your stylist after you schedule a fix. 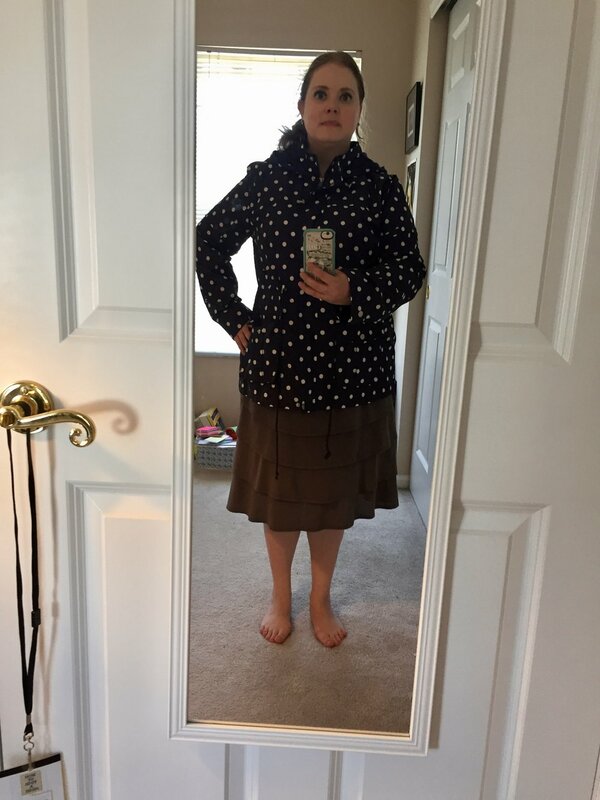 I wrote that I wanted a jersey skirt and a rain jacket, and behold! They appeared! For my next Fix, I have noted that I'd like to try v-neck cardigans again, as well as pullover sweaters, and see things that I can wear to holiday gatherings. I'd also like to see a scarf or two, since I love to accessorize with them. 2. Do a Pinterest board. Here is mine, and you can see, my stylist definitely looked at it! If you don't have Pinterest, it's worth it to get it just to do this board. If you type in "women's fashion" in the search bar, five million pins will come up. I love how Duchess Kate dresses, so she figures in a lot of my pins. I have a fairly classic, pretty style, and that's reflected in what I've pinned. Take the time to do it; it's fun, anyway. At least I thought so. Also put "Stitch Fix" in the title, so if the link is wonky, your stylist can still find it. 3. Do not lie about your measurements. Come on, ladies. Put your real weight, your real bra size, your real height. Just be honest. :) And update it! If you've lost or gained weight, put that in there. Always give the most recent information so you can get your best fix. This also applies to the Pinterest board--keep it current. If you search "Stitch Fix" on Pinterest, you'll get lots of ideas and see items that Stitch Fix has, so your stylist can pull them for you (if it's available)! So, that's my first Stitch Fix box! The next one is arriving in mid-November, and I can't wait to have another fashion-y post with you. Sometimes we just need something fun, right? If you have any questions, hit me up in the comments!